1) Rees, Norman., et. Al., Ed. Biological Control of Weeds in the West, Western Society of World Science, in cooperation with USDA ARS, MT Department of Ag., and MT state University, Color World Printer. 2) Breitenfeldt, Todd, Personal Interview, Biology Teacher, Whitehall Schools, Box 1109, Whitehall, MT 59759. (406) 287-3862, 9-1-99. 3) Doohan, Doug. Control of Persistent Weed in Grass Forage. [Online] Available: http://agri.gov.ns.ca/pt/projsum/96/ddgras.htm. 9-12-99. 4) unknown. Ministry of Agriculture and Food. [Online] Available: http://www.af.bc.ca/publicat/pubs_1.htm. 3-12-99. 5) Written Findings of the State Noxious Weed Control Board. 22 Sept. 2005. 07 Feb. 2007. 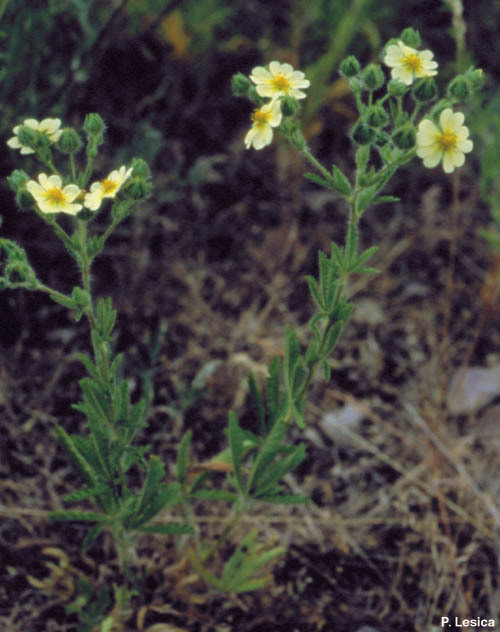 <http://www.nwcb.wa.gov/weed_info/Written_findings/Potentilla_recta.html>. 6) Illinois Wildflowers. 09 Jan. 2007. John Hilty. 07 Feb. 2007. <http://www.illinoiswildflowers.info/weeds/plants/su_cinquefoil.htm>. 7) Ohio Perennial and Biennial Weed Guide. No posted update. The Ohio State University OARDC. 07 Feb. 2007. <http://www.oardc.ohio-state.edu/weedguide/singlerecord.asp?id=361>. Written By: Cara Ryan Published By: Crystal Raue. Updated by: Colton B. 3-2008.